It had been many years since I had last seen “Coach”. We stayed in touch primarily through writing. He was a regular encourager of me even years after he moved back to his home in Oregon and would almost always write back commenting on this blog. He lived a “brilliant life”. He was a devoted husband to his wife Barbara. He was an acclaimed and adventurous race car driver. He was a tenacious marketer. He was a fine, honorable golfer. He was a counselor and mentor to numerous high school students. He was a successful high school golf coach, leading my high school team to State. He was not a father per se but he adopted countless high school students through mentoring. I am one of those students. To me, he was “Coach”, my mentor. 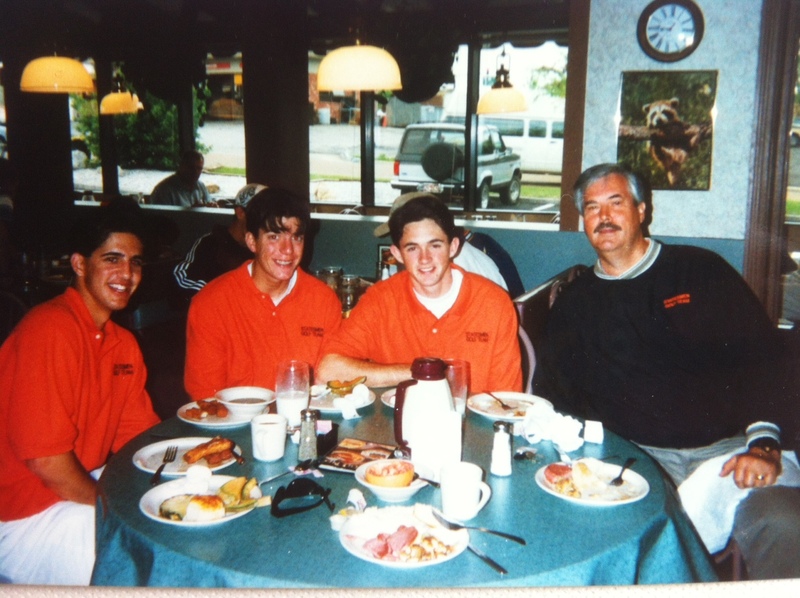 John Marecek, Rick Ewing, and I with Coach at the 1996 State tournament with Coach. 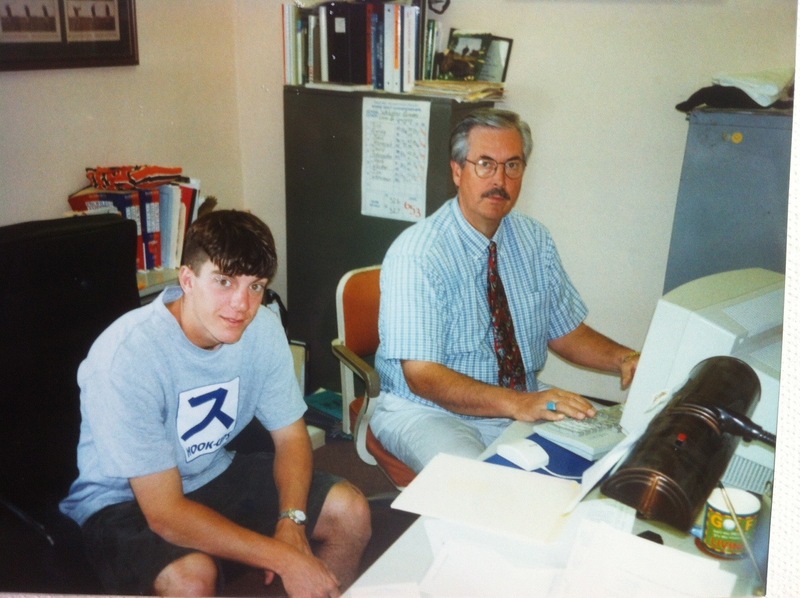 The very first day I moved from Kansas City to St. Louis in 1993, he found me and brought me into his office. I felt little hope before that time as a lost, shy freshman. He immediately plugged me in with Rick Ewing and the golf team and the rest is history. The next four years, Coach invested in me and helped shape me into a confident leader, eventually captaining our team. I am writing this while Open Championship (The British Open) is being played, which is fitting. Coach called me “Radar” because I had the uncanny ability to find missing golf balls. It always makes me laugh because I have lousy eyesight and I just thought I was lucky. My friend Rick Ewing hanging out with Coach in his office in-between classes. Our high school was a public school and our golf team had to compete with the most elite private schools of the St. Louis area. We had a big chip on our shoulder because of this fact and were driven to win but we didn’t know how. Coach recognized this and when he took over as coach he was committed to making our program as elite or better than the private schools. He was impeccably organized to ensure we trained well to compete. He tracked details of how we scored in our rounds including fairways hit, greens in regulation, and tracking putts. These details were usually only captured by college coaches. He even made us look good with better uniforms, bags and club covers. Coach organized spring break trips (with the great help of parents) to go to Florida to play when it was snowing back home. This helped us to keep our game sharp before the heat to the Spring season and were prepared to win. We won our conference tournament four years in a row, sent team members to state every year, and eventually sent our whole team there our senior year. Our senior year he began a new tournament that would serve as a mid-season NIT and we invited all of the top teams in St. Louis to compete. We won that tournament and it prepared us to beat those teams again in the District championship thus taking us to the State tournament. To young men who played under Coach may not have recognized how blessed they were at the time but as they reflected on their experience later in life, I am sure they recognized how well they had it under Coach’s leadership. There is not a day I do not go back to my days on the golf course with him or his office talking about life and golf or the random fun of the day. Although I do not play much golf anymore since my family takes up my time, I still cherish those years in the golf course with Coach. I think he would appreciate that and make sure I knew that golf is a game that I will be able to play until the day I die. After all, Coach had played all the way up until the past few years. Coach’s wisdom and encouragement stay and have fueled me to live life with honor, humility and great adventure on and off the golf course.. Thank you, Coach for believing in me and all of us. Thank you for living well. See you on the links in heaven. Coach’s Obituary that appeared in Salem, Oregon. In my personal and professional life, there are few days that go by that I don’t notice people who have done incredible things to make an impact. The world sees them as examples of success. How did they achieve these things? What made these people different? After reading Outliers by Malcolm Gladwell, it has become easier to answer these question. He asks the same question in his book and in his research discovered some amazing things about what makes these people unique (or not). 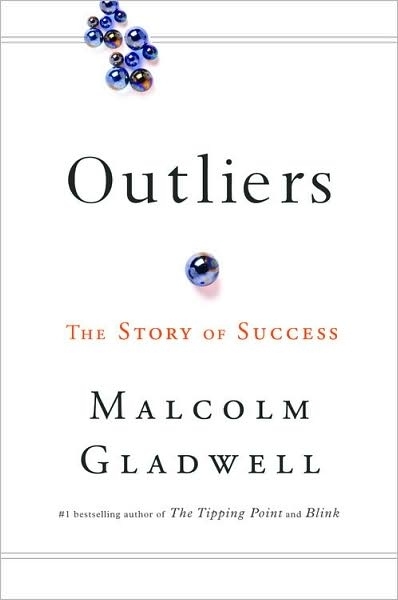 Gladwell shares many examples to support this including a personal story about his own mother and how she achieved success as an outlier. Let me explain my story. When I was eleven years old and beginning my summer vacation before 6th grade, I was asked last-minute to join some friends in a golf tournament. At the time, I did not even remember what the tournament it was except that it was to be played in Kansas City, not far from where I grew up. I had been playing golf for a few years but golf was a distant fourth sport of choice behind baseball, soccer and basketball. I enjoyed the game and was intrigued by it but it wasn’t where I thought I would spend my time. The night before the tournament it poured down rain in Kansas City. I think the tournament anticipated a hundred kids to play in it but the next morning only about fifteen showed up to play and I was one of them. I was a decent golfer for my age but as I mentioned, it wasn’t my priority sport. I won the tournament that day. In fact, it made me the Missouri State Champion for the UCT Invitational and they gave me an all expenses paid trip to Victoria, Canada to play in the North American final. Crazy, huh? It was one of many events that propelled me forward in confidence and ability to keep getting better. It took me through high school golf, college golf, and amateur state play throughout the years. Three years before the tournament that changed my life, my family moved across town in suburban Kansas City and our new house happened to be on the first hole of a small golf course. That particular golf course happened to be one of the best junior golf programs in all of the city, which provided me the best opportunity out of many kids to excel in the sport. My parents were not serious golfers but my grandparents bought me my first set of clubs that year and I took up the game. After given the opportunity to win that tournament, I never looked back and eventually quit my other sports to play more golf. Lining up with my playing partners at the UCT North American Golf Tournament. That is me in the middle. Nice visor! Gladwell was spot on and my story is more confirmation of it. Is life just a roll of the dice then? Gladwell doesn’t draw a specific conclusion on why certain people are chosen but he hints at something greater. His hint is what strengthens my faith. It is humbling because it means that in life we never achieve success on our own. We need others. We need God to put us in the right places at the right times and guide us in his perfect purpose. Think about something you’ve excelled at in life. It is there that you see God at work. The United States Golf Association (USGA) is running an amusing and compelling ad campaign focused on better pace of play on the golf course. These are some of the funniest ads to ever come out of the traditionally conservative organization. The commercials feature major golfers and celebrities like Tiger Woods, Anika Sorenstam, Paula Creamer, Arnold Palmer, and Clint Eastwood. Here are a couple of ads from the campaign. 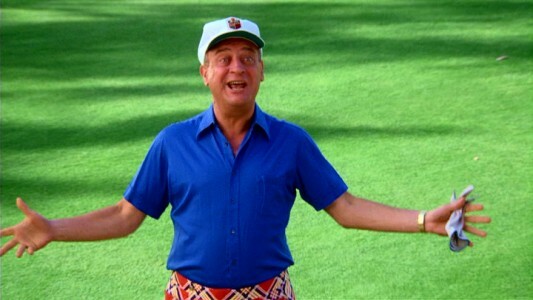 To fully appreciate it, watch the inspiration from the campaign in the movie Caddyshack. The line was apparently thought up by Rodney Dangerfield and not in the script. It is hard to not play a round of golf and not hear this great line. The campaign hit a personal note for me. It was two years ago the last time I played golf on a Saturday. The round took six hours not including the time it took me to drive to and from the course. Overall it was almost an eight-hour Saturday. Our foursome did have a good time but we ultimately wanted to play a normal four hour round and left very frustrated. If that is how golf is today, I can wait until my kids grow up until they take interest in the game and want to learn. I miss golf and am thankful for playing it as a youngster through competitive play in high school and college. It was on the course where I first understood what perseverance was and how to conduct myself by the examples of other older gentlemen. I am still young as Rodney Dangerfield says so I have time to get back to the game. I am thankful because one can play golf until the day they die unlike soccer, basketball, football, or baseball. I wish I could say that I’m spending every moment of time exactly how I like or how I am supposed to. There are plenty of noble demands from family, work, church, and friends but every weekend when I see golf on TV, there is something that stirs me to want to get out and play. I am reminded as I walk out the door with my family that we only have this time once so my old friend, the game of golf, I shall return. Do you have a difficult time embracing the sports of your youth because of the time it takes to play? Should Christians Cheer for Tiger Woods? It’s the question I’ve been asked from time to time. I feel like I have grown up with Tiger Woods. I had great aspirations of becoming a world-class college golf player and then on the PGA Tour but those dreams didn’t quite come true. While I was struggling to make cuts, he was winning US Junior Amateurs and US Amateurs. Then, as a senior in high school we witnessed him obliterate the field at the 1997 Masters. Since then he has gone on to become one of the most well-known athletes in history. He motivated millions to take up the game, buy Nike gear, and hack it with the rest of us. He inspired us to seek greatness. That was until the world discovered Tiger was human in 2009. He then was simply, Eldrick Woods. The superhero Tiger Woods’ kryptonite was revealed in the form of adultery, greed, lies, and the root of it all, pride. What came next was the real horror. During The Master this year, it was interesting to hear what self-proclaimed Christians were still saying about Tiger. Sounds a bit like my 3 and 5 year olds. I confess that it sounds a lot like me too. There isn’t a day that goes by when I don’t sit in my holy chair and judge others, especially people like Tiger Woods. This scene of judgment is not much different from the pharisees with stones in hand ready to throw at the sinner. There have been some great articles and blogs written about this question of how we biblically should respond to Tiger Woods, most notably in Sojo. I encourage you to read this for good perspective. Why do I cheer for Tiger? It will be good for the game of golf for him to win. He brings excitement like few others in history have provided. That excitement has encouraged friends of mine whom would never have played to give it a shot. Golf has suffered when Tiger isn’t on top of the leaderboard. He is not perfect but is striving to earn his way back for the game, for himself, for us. I do get annoyed from time to time when the golf media focuses on him when lesser known players are leading. But I know that it helps everyone financially and professional golf is indeed a business. He pursues greatness in golf. He has been humbled in that pursuit but his undaunted spirit is inspirational for any golfer. I believe God’s story is about redemption and he may very well be doing some amazing that we don’t know yet in Tiger’s life. Tiger’s story isn’t over yet. He still has a golf career and a life to live. I love the “what if” dreams. What if we put our rock down and looked in the mirror more? What if Tiger’s golf comeback is merely the beginning of something bigger in his life? What if his comeback story leads him to Christ? What if his redemption story could inspire millions? Inspire me? Inspire you? This morning I stepped outside and looked out at my back yard. The coffee was just right and I decided to take a stroll around the yard. I stepped into the grass and my foot became engulfed with dew. Those steps became a reminder of my summers when I was young. I was blessed to move at the age of 8 across town in Kansas City to a little nine-hole golf course. It was there that I spent most of my summer mornings waking up early and hitting the dew soaked tee-box to begin a fun round of golf with my neighborhood friends. We were blessed with one of the finest junior golf programs in the city and it was in those years that I fell in love with the game. Occasionally none of my friends could play so I would join a group of retired gentlemen. These men loved having a “youngster” join them to play. They played a relaxed pace but still kept score and honored each stroke with patience and routine, while paying close attention to the rules. They kept accurate score, called penalties on themselves, and would laugh and talk about all sorts of things in life. Most importantly, they took the time to invest in me by teaching etiquette and that golf is a great game to play by yourself for a challenge. With that, they taught me by example that relationships you can develop in a golf-foursome are invaluable. Last, watching these gentlemen play showed me that the game was a sport that could be played until they day I die. Even at the age of 8, it was clear to me that this game would never go away. I’m pretty sure I became a morning person because of the game of golf. This is why I’m writing this now in the wee hours. I don’t play much golf anymore since I have a young family and my mornings are spent clowning around with them. My kids will soon be spending their summers at sports and other craft camps so it will be interesting what connects with them. Their stories will be written in the next few years and I can’t wait to read them. Tell me your favorite summer sports story when you were young! What did you learn from it? 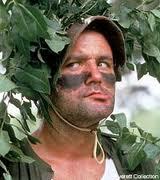 Here are the Top 10 Caddyshack Lines you will hear around the office today. Boss: You take drugs, Danny? Boss: Good. Then what’s your problem? Client: This your place, Carl? You: Yeah, whatta ya think? You: Well, I got a lot of stuff on order. You know… credit trouble. 10. You arrive at the hotel during a business trip. You ask the receptionist “This place got a pool?” Your friend next to you says. Your friend: You’ve got to win this hole. Your friend: Me winning isn’t. You do. When I was 8 years old my family moved across town in Kansas City and found a lovely house that sat above the first hole of an executive (shortened) 9 hole golf course. Like most kids that age, I was playing soccer, baseball, basketball, and tennis. Later I even tried football. I was doing way too much but my parents were just trying to test out what I enjoyed and fit me best. My grandparents that year bought me my first set of golf clubs to try out this new sport. 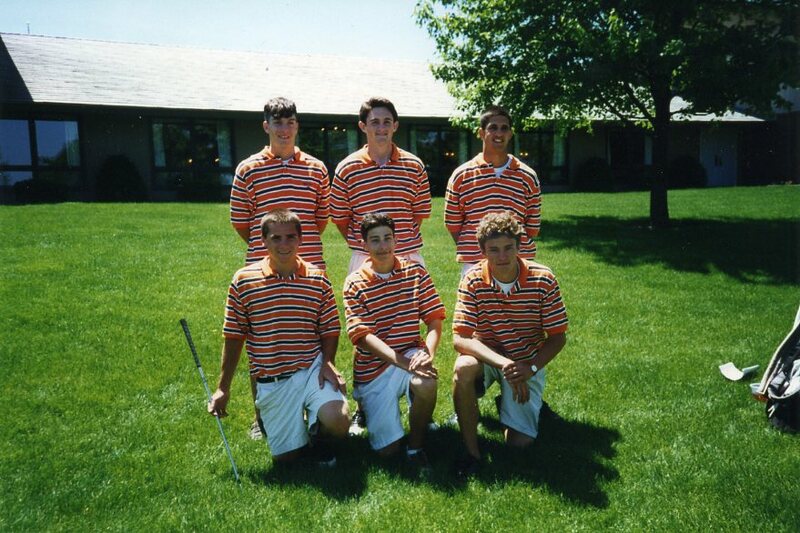 Thankfully we had a tremendous local junior golf program and I began that journey. 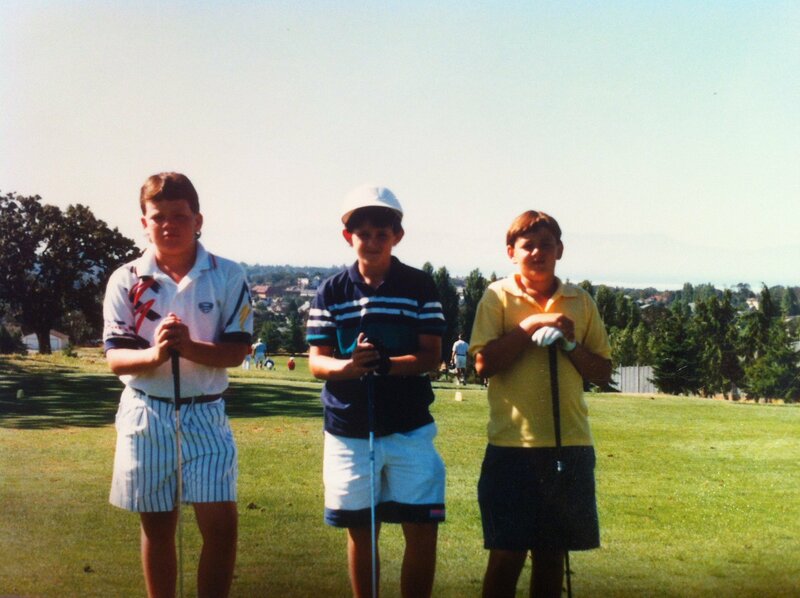 I was truly hooked at 11 when I played my first golf tournament outside of that course. It was the United Commercial Travelers Junior Golf Tournament qualifier for the state of Missouri. It was a mere 9 hole qualifier and the night before the area received a lot of rain, which discouraged many players from even showing up. 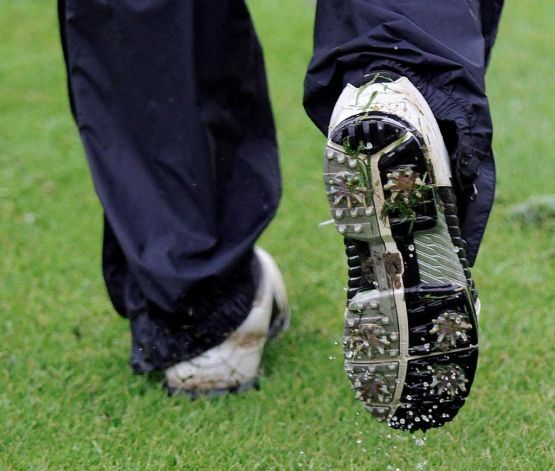 The field ended up being about a dozen golfers qualifying to go to the national tournament in Victoria, British Columbia. I can’t even remember what I scored that day but it was enough to earn the victory and get a free trip to Canada for the tournament. My dad accompanied me on that memorable trip. I remember not playing very well in Canada but what it did do was hook me into the game and so I began giving up other sports one by one. The person who taught me golf told me I had to either quit baseball or golf, my swing would be mess unless I did so. My summers became filled with traveling around Missouri and Kansas, playing in golf tournaments and spending endless hours practicing on the driving range and putting green. Golf to me was perfect for my personality at the time. It thought it was perfect. When high school came along I played on the school team. For the first time in my life I was part of a team. A golf team? It is an individual sport, right? 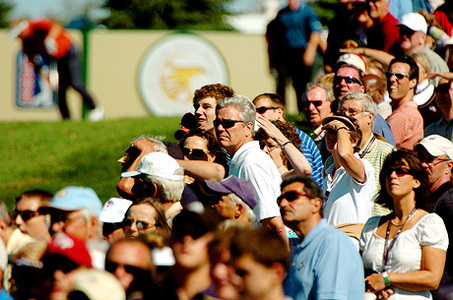 If you have seen The Ryder Cup or The President’s Cup you usually witness a spirit among those players that is unlike any other time in their individual tournaments. You will see high fives and cheers for each other in individual matches to succeed as well as select formats of two-man best ball and alternate shot. In team golf there are still individual awards for lowest score but the most important prize goes to the team that wins. 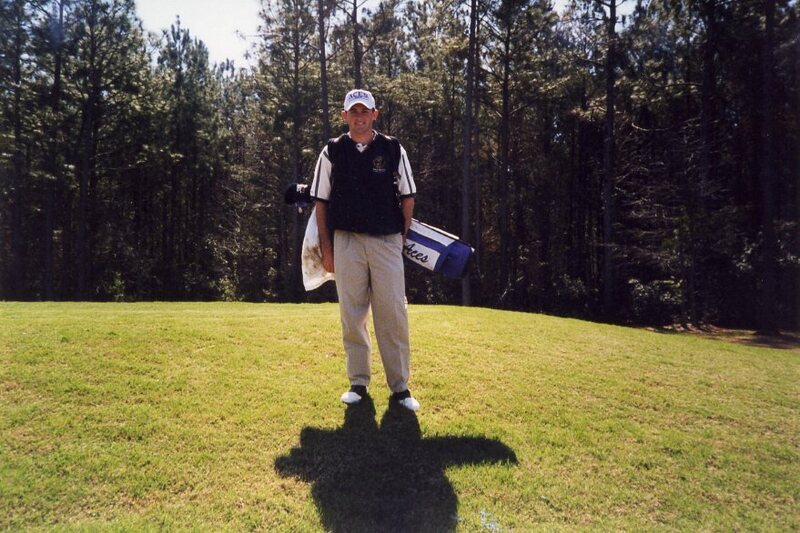 Throughout high school and eventually in college golf I was a moderate success on an individual basis. There are 5-6 players that play in tournaments and I was usually the #3-#5 player. I don’t recall any major wins individually but I do remember every big win our team made. 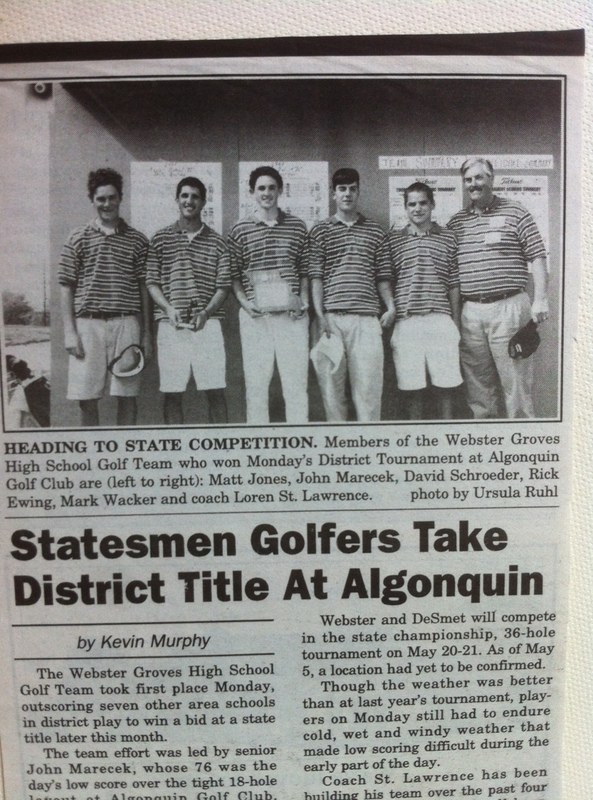 Even on a day I had a double-eagle in a high school tournament, what was more prominent is that our team, the Webster Groves High School “Statesmen” won that tournament and eventually went on to the state championship tournament. I was elected Captain of the team so it was my duty and pleasure to celebrate that feat. It felt amazing. Life can be an individual journey. It is your life to live. But you can’t live it alone and you surely cannot succeed without others. Even professional golfers have a team of people with them to motivate, teach, and even just listen to them. Most of us in our jobs today work on an individual basis. That mentality is wrong. Look at any successful person in life and you’ll discover their teams. I love the teams I’m a part of today: My team at work, my church St. Bartholomew, my men’s group, my close friends from Young Life, friends in Kansas City, St. Louis, Evansville, and Nashville, and I would be lost as can be without my family. My last hole in my college golf was memorable for the most inglorious reason. I duck-hooked my drive into a lake and ended up with double-bogey. I remember being mad at myself because I felt like I let the team down. I was blessed to graduate a semester early and later the team won a big tournament that spring. That is what I remember most. I’ll take the Ryder Cup competition any day. Tell me about your teams.